Jan Dowland, who has led Wellington Community Trust (WCT) since 2012 is handing over to fellow trustee, Gerardine Clifford-Lidstone. We asked Jan and Gerardine to talk about their vision for WCT and their experiences of being a trustee. Jan: I took on the position of Chair following a long period of stability. There was a longstanding Chief Executive and Chair, and a well-established culture and way of doing things. My appointment coincided with the departure of the Chief Executive followed closely by the funding adviser and the accountant. To top things off the earthquakes in 2013 left our building uninhabitable. So from a period of stability we entered a period of change and renewal which was as exciting as it was challenging. WCT: How did you manage? It sounds as if you almost had to start all over again. Jan: Working together, the Board and a new team had the opportunity to redefine what was important to the Trust. I was keen to see a shift in our funding practice from being purely reactive to a more proactive strategic approach, especially when it came to addressing complex social issues. I was also keen to see the Trust use the considerable skills of its trustees in better ways. This has led to us being more outwardly focussed, and means we can better understand and engage with our diverse communities. We’re getting better at stepping up to acknowledge and celebrate the great work they do. When I look at this year’s Annual Report I can see how far we have come. We’ve achieved a lot. Gerardine Clifford-Lidstone, a born-and-bred Wellingtonian, has been a trustee since 2010 and brings a wealth of experience to the role, particularly from her experience with developing ways for government and business to work successfully with Pasifika communities. Gerardine: Jan has set a high benchmark during her tenure as Chair. I’m very keen to continue on the strategic granting pathway which we have ventured down this year with our inaugural My Children funding round. I’m also keen to look at other types of strategic partnerships that will help us achieve greater impact. I think it’s important for us to get a better handle on responsible investing and understanding what this may mean for our investment portfolio. Most community organisations that I have been involved in do great work but face an ongoing struggle to seek funding and find support to do all the things they want to. They are often working with the most vulnerable people in our communities and that can mean really hard work for a lot of dedicated and committed people. What is special about WCT is that we can help! By making smart investment decisions, coupled with having a good sense of the needs in our community, we can channel funding to a wide range of initiatives across our 4 General Granting goals and other funding programmes. I’ve accepted the appointment to chair WCT not only because of my natural interest in governance and strategy, but because I have a strong belief in the vision of the Trust and also believe I have the leadership qualities to maintain the strong sense of cohesiveness that Jan (and our team of Trustees) have built up over the past 4 years. WCT: How do you see your fellow Trustees supporting your work as Chair? Gerardine: I have worked with this team for nearly 6 years. They are incredibly talented and represent a wide range of professional backgrounds and experience. There’s a good balance of gender and ethnicity, and come from all over the Wellington region. This diversity inevitably leads to robust debate as we try to make decisions in the best interests of the Wellington community. Collectively they are very knowledgeable and have ‘their finger on the pulse’ across many aspects of the wider Wellington community. They are always very open to sharing their specific expertise when it is needed and they can see the big picture. When they bring these elements to the Board table, it makes the role of Chair easier. Jan and Gerardine’s backgrounds play an important role in their work for WCT. 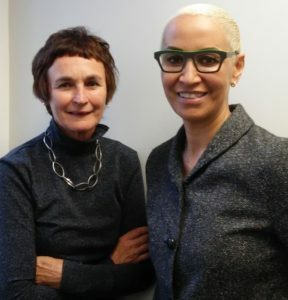 Jan has worked in mental health and social services for much of her career, while Gerardine has strong connections with Pasifika communities. Jan: Working with people who have experience of mental illness and intellectual disability has given me an insight into the challenges they face, especially when they find themselves on the margins of society. I also have a good understanding of the strong sense of social justice that drives the organisations that work with people affected by mental health issues or disabilities – they, like many of the organisations we work with through the Trust, really want to make a difference. Gerardine: Many Pasifika people benefit from the organisations we currently fund, although this is often through mainstream organisations. I do feel a personal responsibility to inform Pasifika and Māori groups and organisations of opportunities to access our funding. It’s important that they are aware of our goals, funding criteria, and deadlines. We have done a lot of work to simplify the grants process to make it easier for these groups to apply. Sometimes it helps if the information comes from a ‘trusted source’ and I’m looking forward to giving more support to the Trust and applicants in this area. WCT: And what do you think makes a good trustee? Jan: In my experience, the ‘softer’ interpersonal skills are important – an ability to engage with a wide range of people, work as part of a team and respect the principles of collective responsibility. It’s also vital to have an inquiring mind and an openness to new ideas. You need to be able to draw on your personal experience and use that for the benefit of the group you are working with. WCT: And what advice would you give to community groups looking to appoint trustees to their boards? Make sure people have the time to contribute. Being a trustee involves more than sitting at the board table. Find people who are ‘team players’ and who can put aside personal interests for the good of the organisation. Look for people whose values align with your group – they will comfortably embrace the vision and mission of your organisation.